A friend from Paris told me that life is but a series of meaningful memories, as we sipped wine in a swanky bar in Saint Germain, Paris’ left bank. Amid a stylish, handsome crowd, I enjoyed our continued conversation. I was in France celebrating my 25th anniversary with my wife. We’ve built quite a few memories together. Those memories are indeed a huge part of what bonds us today. But we also are both forward-looking enough to know many more lay ahead. That anticipation may perhaps be even more bonding for us moving forward. If one really believes life is just a string of memories we make, then remembering the past is important but not enough. Life is a continuum and we need to really appreciate the present and the memories being formed today as well. My trip to France was made so much more memorable because close friends and family members joined us. We had amazing foods, saw phenomenal sights and laughed together until our stomachs ached. We were in the memories of the moment. Shari and I decided to put a love lock celebrating our anniversary on the Pont des Arts, a footbridge crossing the Seine from the Louvre. Couples have long puts love locks on this bridge as a symbol of their binding love. There is also another bridge more crowded with love locks but mostly for ‘lovers’ enjoying secret liaisons. Got to love the French. Shari and I along with our friends went to the more appropriate bridge on a glorious, crisp Paris night. With the bright and romantic lights of the city shining upon us, we ceremoniously put our love lock on the bridge. We made yet another memory and enjoyed the magic of that moment with those dear to us. Those are the memories that make life rich. Now, I can’t wait for the next great memory ahead, just as life should be — a string of memories that we create. 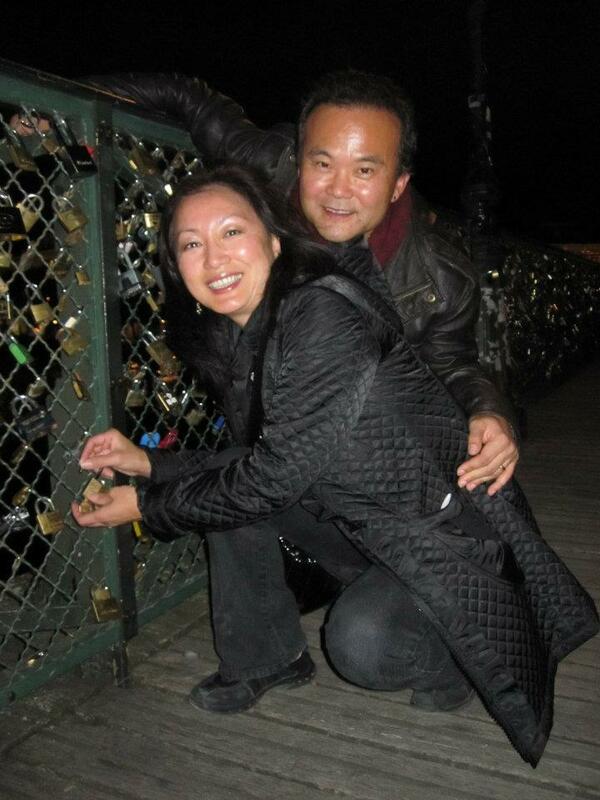 Posted in Travel and tagged anniversary, love locks, Paris, Pont des Arts, shari song. Bookmark the permalink. Hi! I could have sworn I’ve visited this website before but after browsing through many of the posts I realized it’s new to me. it andd checking back frequently!